Come here all my oily fellas. I have got something for you that you will love. A perfect face wash for oily skin – Saslic DS Foaming Face Wash. A heaven in cute bottle. Lets know how it performs and in what conditions. What to do and what not to do with this one and how to use it !! I got this gem when my Cetaphil Cleanser for oily skin was finished and I could not get new one anywhere, no where available it was (my chemist got it for me some days later J). But till then, I have got this one and I am happy for that. 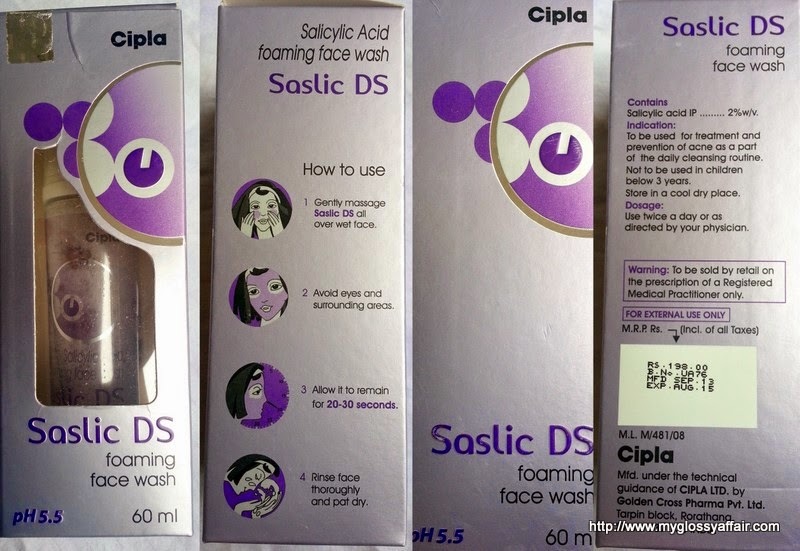 Saslic face wash come in two variants – Saslic and Saslic DS. Saslic face washhas lesser concentration of salicylic acid, say 1% and suits most of the skin types. Saslic DS face washhas a little bit higher concentration of salicylic acid, say 2% and is meant for more oily, acne prone skin. I got Saslic DS for myself as I have very oily, acne prone skin and needed something for me that can make me float through summers and humidity easily without the breakouts and those unwanted pimples!! My wishes came true and this one worked for me J.
I was a little afraid to use this thinking that what would that 2% salicylic acid do to me. Yes, it does but nothing negative. The bottle looks quite good quality wise. A transparent one with hint of purple that contains transparent liquid. 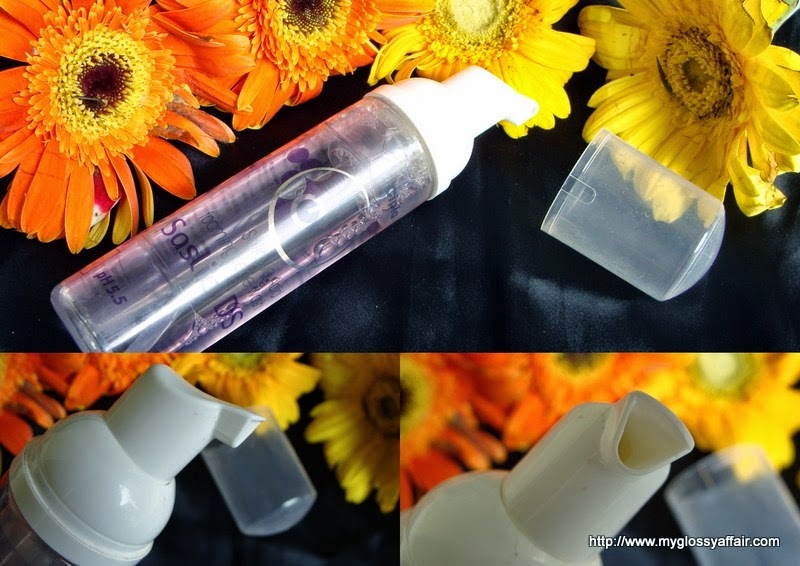 It has a spray pump to take out the product and a single spray is enough for your full face. Hence, the little quantity you see in bottle goes for almost 2 months with regular usage. Quite good for its results. You will not be disappointed. The transparent liquid when comes out on your hand, turns to white foam. Quite innovative J. I like that white foam!! It is very light, doesn’t lather much but cleanses very well. It leaves my face squeaky clean and has stopped any new pimples or acne occurrence and reduces oil too. How I use it – just take a spray pump of this white foamy wash, apply on wet face, let it sit for 20-30 seconds and wash off. You are done J.
Gently massage Saslic DS all over wet face. Avoid eyes and surrounding areas. Allow it to remain for 20-30 seconds. Rinse face thoroughly and pat dry. To be used for treatment and prevention of acne as a part of the daily cleansing routine. Not to be used in children in below 3 years. Use twice a day or as directed by your physician. This face wash come in a cute, almost transparent, but a hint of purple coloured bottle which has a nozzle spray and a white cap to cover it. Perfect for travelling or carrying around. The packaging is quite sturdy. Amazing for oily acne prone skin. Cleanses the face very well leaving no impurities behind. Prevents further occurrence of acne/ pimples. Convenient spray nozzle pump dispenser. Availability – some online stores or chemist shops. Stop using salicylic acid based face washes when you are on some medication for your face, like you are using some hydroquinone based topical creams or any such things. Whenever your doctor suggests you such creams, discuss with him/ her always, about all other products that you can use or not. All sort of products don’t work together all the time. No toner is required afterwards. The ‘T’goes away from your ‘ÇTM’routine. In fact, nothing should be applied for at least 15-20 mins after you use a salicylic acid based face wash. You can use your serums or moisturizers but after 15-20 mins. I would surely recommend it and repurchase it. In fact, I now use my Cetaphil oily skin cleanser and Saslic DS alternatively and I love both. Nothing else. Never. Nothing else works for me, whatever the brand is, or whatever it claims!! Oily skin beauties or fellas, don’t suffer any more, give this one a try and if it works for you too, then be happy. You have got your HG face wash ;). Don’t experiment much with oily skin. Those over the counter face washes are not meant for us. Found a good one for you and stick with it if you don’t want to end up with face full of pimples most of the year. If nothing works, stop experimenting and go to a dermatologist and use what he/she suggests. Thanks for the review! Sounds like a great product! Lovely review, i think it works well! first time to hear about this product i also think i havent seen this before in any drugstore? where ca i purchase this? great review by the way. i have really really oily acne prone skin and it contributes a lot to my self-esteeem huhu. Its for favorite face wash these days. I've been looking for this for a long time now but my lcal pharmacy doesn't have it. They have never even heard the name. Can you get it online and where????? Never heard of this brand and sure I need to check online. I have no issues with pimples or acne, so let me see if there's another for combination skin. Great and honest review. Thanks for the review, great post! I once used it on my dermatologist's recommendation and it was really great. Thnaks for sharing this dear!! I will definitely try it!! 🙂 It would be amazing for acne prone skin. Sound amazing now I want it. I would like to try this product! seems great. i would love to give it a try. Perfect review my dear ! i had tried the orange one and quite liked it! Great for oily acne prone skin! awesome!!! so interesting!!!!!!! thanks for sharing sweety!! Looks like a good one for acne prone skin. You have reviewed it very well. Great review Charu! This sounds perfect for oily skin…thanks for the details. This is such a thorough review, with so much good information. I no longer have acne but I think this product may help balance out my skin. I have oily to combinations skin I will have to try this product out ! Thank you so much for stopping by my blog last week !I have started following you on Twitter, facebook, bloglovin and google +. I use this one too and it's so good! Where I can get this face wash via online stores?